Take the rubber ball in your hand so that the thumb lies in the middle of the top, as illustration A shows. A slight pressure is sufficient to produce the most natural mating calling of the roe. See illustration B. To produce the terror cry, press with the thumb quickly but moderately till it reaches the bottom of the rubber ball, whereby the mechanism sets itself in motion and so forms the terror cry-decoy, as shown in illustration C.
The mating call is reproduced by applying pressure to rubber bulb and thus changing shape from position A to position B (see illustration). The fitted cap has one front and two side hole openings to form the tunes. To produce a tender, natural mating call, keep one or two of the openings shut; if you wish to keep one hand free. omsert small wood pegs through openings on both sides of the rubber cap, and in this way you can keep your gun in shooting position while decoying. If all three openings are covered, the call will sound especially soft and subdued. Two blasts with a 3 second pause between blasts (fie . . . fie), then 10 second pause, then three blasts fie with a 3 second pause between blasts (fie . . . fie . . . fie), again 10 second pause, then two blasts, and so forth as before. Then two to three ,minutes rest. where after the whole theme can be repeated. Before beginning to decoy, oay attention that the stand is mounted as noiselessly as possible. 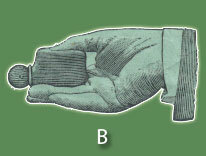 Take the rubber ball in your hand as is shown on illustration A and, press ball from position A (see illustration) into position C, down to the bottom of the ball, as in the mating call. Thereby a tune is produced similar to a “pia” . If one has obtained the necessary firmness, then the decoying is done according to he following theme, towit: once “pi”, then short pause; then “pia” with 3 second pause, “pia” with 3 seconds pause, “pia” with 5 seconds pause, “pia” with 3 seconds pause, “pia” with 3 seconds pause, “pia” with 5 seconds pause, “pia with 3 seconds pause, “pia” with 3 seconds pause, “pia” with 2 minutes pause and so forth. The last tunes are to be made with shaking hand; in this case, the ball is to be pressed quicker. One should not decoy too much. The less and the more quiet one decoys, the better the results when roe calling. When beginning to decoy, start decoying from out of your pocket or wrap a cloth around the decoy so that the tune can only be heard for a small distance. “when windy weather, omit to decoy” . After the decoying, one should at least remain quietly at the stand for 15 mins, as it may happen, that when leaving the stand too quickly, the roe buck may spring off bleating.